Making their first appearance in the senior’s team practice on Tuesday, new pool members Kevin Alas, Baser Amer, and Raymar Jose are just ecstatic to have the chance to represent the country anew. “I’m grateful for the chance to be practicing with the Gilas pool and I’m happy to serve,” said NLEX’s Alas. “I’m happy that I’m a part of this and I’m thankful to coach Chot (Reyes) and the management for including me in the program,” Meralco sophomore Amer echoed. “For me, this is a big opportunity because I’m practicing with great players. This is just a huge blessing for me,” said Cignal bruiser Jose. But this wasn’t the first time these three will get to represent the country. Alas is a part of the silver medal-winning Gilas Pilipinas squad in the 2014 Fiba Asia Cup after previously winning the gold with the cadets squad in the 2013 Southeast Asian Games in Naypyidaw, Myanmar. On the other hand, Amer was one of the lead guards to steer the Philippines to the gold in the 2015 SEA Games in Singapore. Meanwhile, Jose also donned the national tri-colors once, as he was a part of the squad which won the championship in the 2016 SEABA Cup in Bangkok, Thailand. 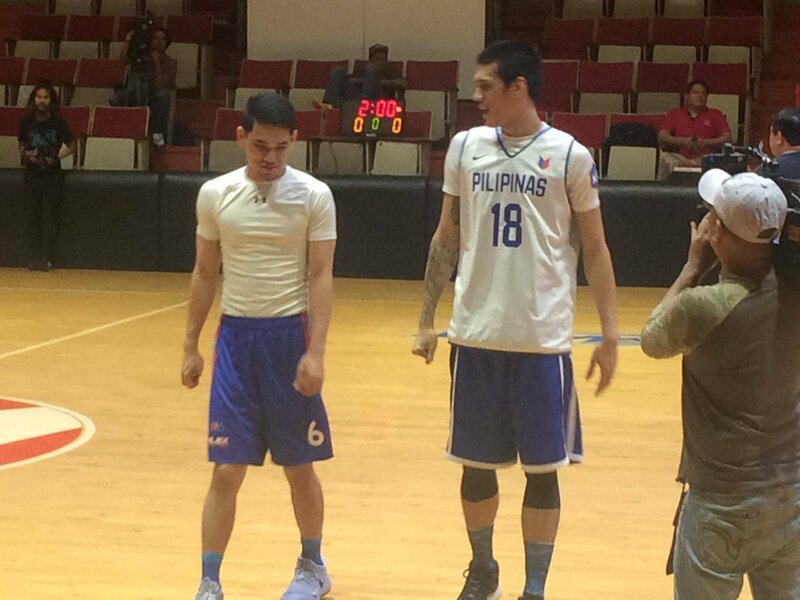 All three said they felt fitting in quickly with the pool in the resumption of Gilas Pilipinas’ practices at Meralco Gym Tuesday night. Alas hit it off the bat with Raymond Almazan, who was his teammate back in their Letran days. “We’ve been together for so long, from Letran to Cebuana in the PBA D-League. Me and Raymond are really very close so I’m happy that we’re teammates again,” he said. Amer felt the same way, working closely with mentor and Bolts assistant coach Jimmy Alapag. “He helps me a lot. He’s the one who urges me to do extra work and teaches me a lot on how coach Chot’s system goes,” he said of the help he’s getting from Alapag, who also serves as one of the deputies with the national team. It also was a reunion of sorts for Jose, who found himself side-by-side with his fellow Far Eastern University teammates in the Gilas pool. “It feels so great to be with them again. All of them are in the PBA now, so they’re on an another level. I just feel glad with this chance,” he said while Mac Belo and Mike Tolomia messing around with him in the background. But the job is just starting, and all three know that the goal in mind is to get a crack at one of the two rosters for the upcoming 2017 SEA Games in Kuala Lumpur, Malaysia and the 2017 Fiba Asia Cup in Beirut, Lebanon, both slated in August. “The goal is to help the country win another gold. But my mindset right now is to listen to the coaches and learn the dribble-drive system,” said Amer. Gilas Pilipinas resumes its practice on Thursday, with Reyes expecting Chooks-Pilipinas 3×3 players Kiefer Ravena and Kobe Paras, as well as Fil-German forward Christian Standhardinger to finally appear before him.